Writing reviews can be a tedious task, but it’s a pleasure and an honour to write about this unique music project, which came together last year in what must have been a massive effort. It was spearheaded and organized by my friend and neighbour, Michael Oesch. Michael is a fine musician, a songwriter, and a recording engineer – he has a very cool studio in his house, and owns his own digital media company. He also seems to have more instruments than any musician I’ve met. Not an audiophile, but definitely a gear nerd! Michael is a quick-witted guy, with great hats and a generally sunny disposition. 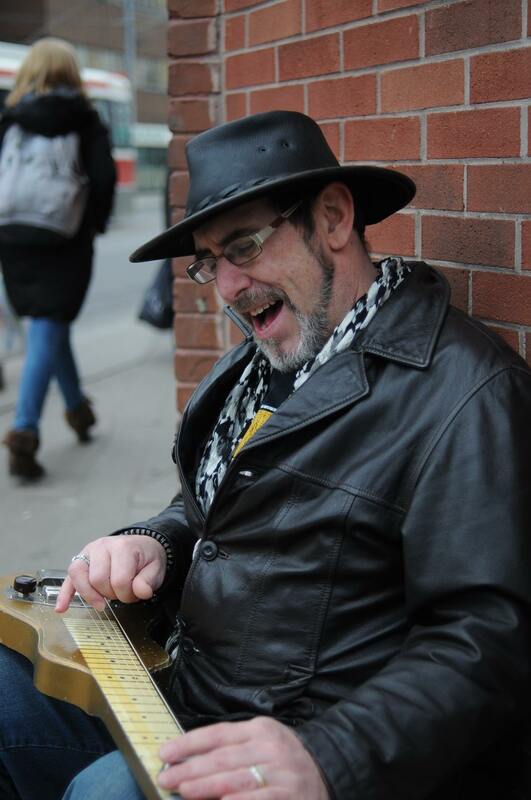 Last winter on Facebook, Michael came across a video of the Hindustani slide guitar player, Rhitom Sarkar. After trying to replicate the amazing sounds that he heard Rhitom performing, Michael was even more beguiled, and he decided to contact Rhitom to talk about a possible collaboration. 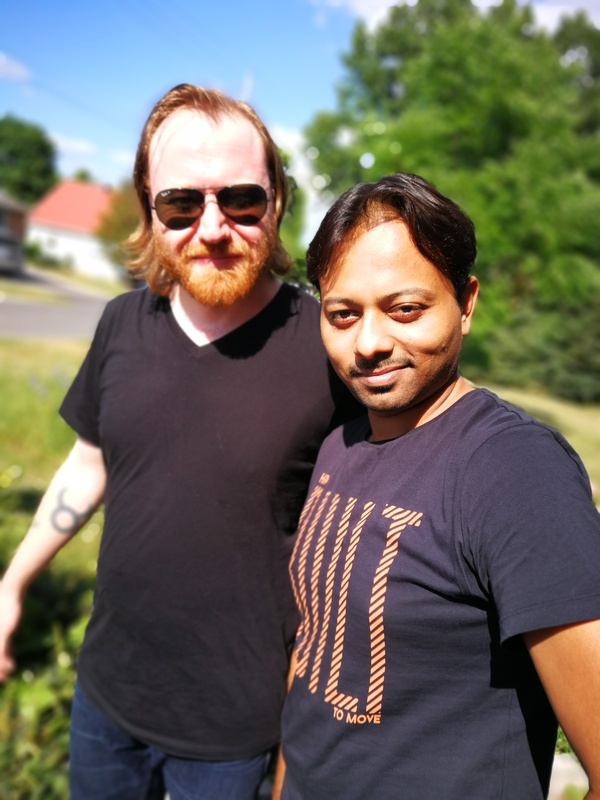 Fast forward to the summer (2018), and Rhitom came over from India for a month, to live, play and record with Michael and a group of superb Canadian musicians that were assembled from all over. For the most part, these recording sessions happened in Michael’s home studio, here in the little town of Waterford, Ontario. 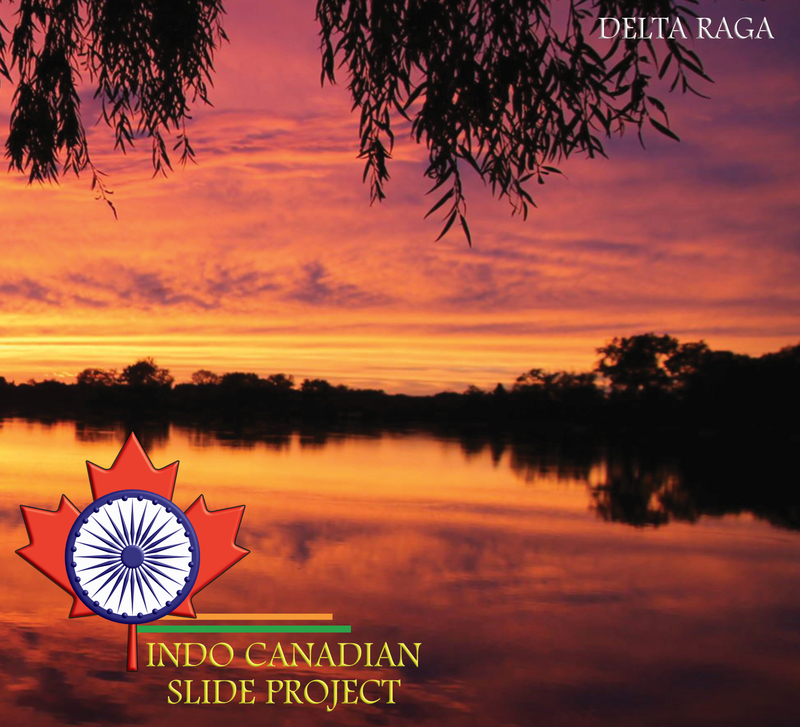 The ensemble became known as the Indo Canadian Slide Project, and this album release is called Delta Raga. I’ve been listening to an advance copy of the final masters from these sessions, which I’ve also burned to a CD. There are fifteen tracks, all beautifully performed and many of them are quite unique, and completely mesmerizing. If you enjoy instrumental music that paints large and complex soundscapes, and draws outside the lines (yet still remains very melodic), keep reading. Although many of us have listened to Ravi Shankar (or at least George Harrison), the sitar, and even moreso the Hindustani slide guitar, is a mystery to many Western music lovers. Not only the instrument itself, but the unusual scales and progressions of Indian classical music, and the ragas tradition. I’d be the last one to attempt to deconstruct it – but I’m somewhat open-minded and curious about it! I did find what I think is a decent introductory article on the subject of the Hindustani slide guitar, or mohan veena, here in Premier Guitar. WoS readers may be familiar with the fairly well-known Water Lily Acoustics production A Meeting By The River, the 1992 collaboration between Ry Cooder and Hindustani slide guitar master V.M.Bhatt. It’s considered a great recording, and somewhat of a landmark in fusion – or what categorizers would call “world music”. If you’ve enjoyed those types of East Meets West collaborations in the past, keep reading, this is for you. All of the musicians involved on Delta Raga are exceptionally talented. But clearly, the spotlight with this release is really on Rhitom Sarkar, and his wonderful slide mastery. Rhitom was classically trained under Shyamal Chatterjee, whose guru was Ravi Shankar, and he has studied and worked extensively with other masters, including Debashish Bhattacharya. 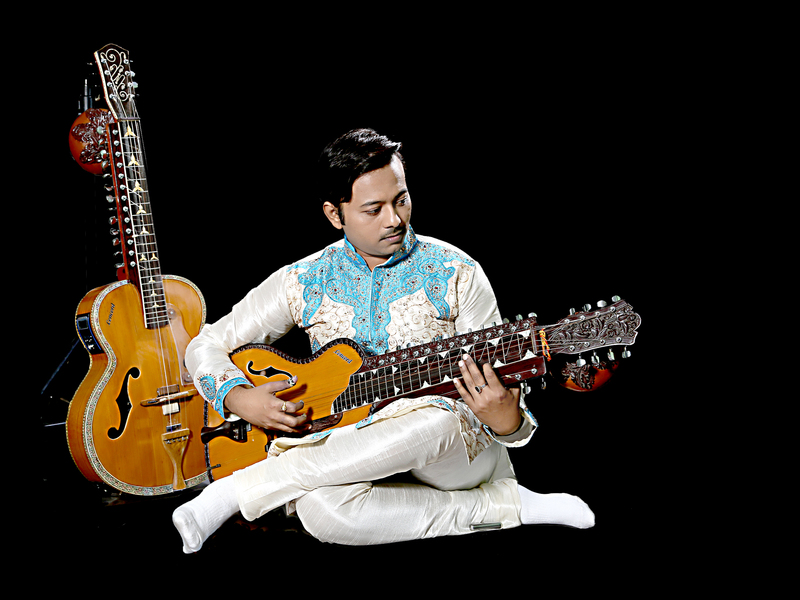 He has performed with Anoushka Shankar, and played before large festival audiences in India. When he performed for a group of only 9-10 people at the Oesch’s house party in late July, it was with an incredible intensity and passion. Rhitom is able to create amazing sonic landscapes, even with minimal accompaniment. I was very thankful to be there that evening, and it was easily the musical highlight of the year for me. In addition to bringing Rhitom to Canada for these collaborations, Michael also pulled together a host of great players; two-time fingerstyle guitar champion Don Ross, Juno-nominated blues player Sean Pinchin, slide man Dan Walsh (formerly of the Flying Squirrels), South American bluesman David West, Bluegrass picker Ivan Rosenberg, Dobro player Guy Westbrook of the Kil Billy’s, and vocalist Sarah Siddiqui. 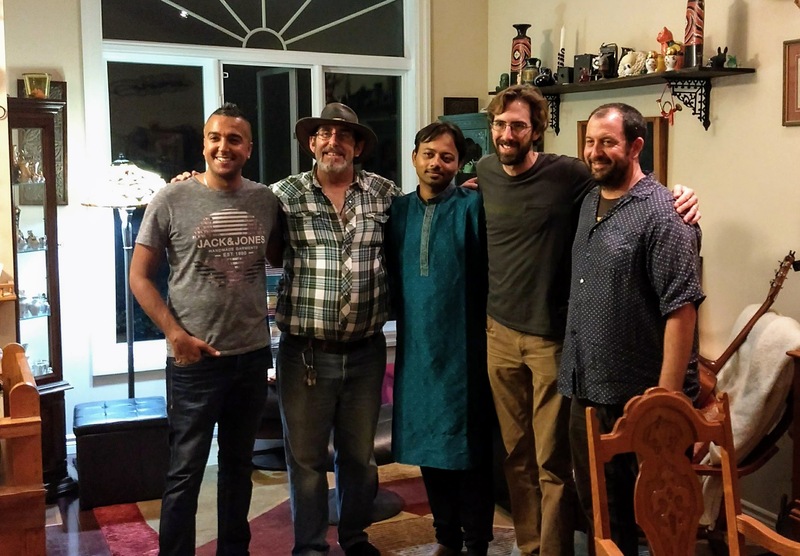 Other contributors included guitarist Adam Shier, bass player Brian Chhurangur, percussionist Andrew McMullen, and tabla player Sonesh Chattlani. Wow, where to start. Did I say unique? 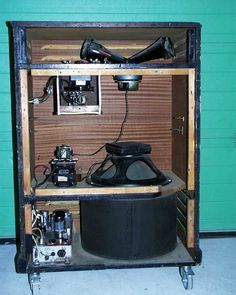 This is quite likely the only known instance of recording the sympathetic strings of the Hindustani slide guitar amplified through a classic “Leslie speaker”, with its unusual rotating baffle. I’ve seen and heard the Leslie at Michael’s place, it creates some beautiful sounds, and I think really adds an organic warmth and vibrancy to the Delta Raga recordings. There’s an overall cohesive feel to this disc, even though each track is quite distinctive, and often in a very different style, from the previous one. A few of the songs could be said to have simple progressions, but most of them are deceptively complex. What’s most remarkable to me is how seamlessly the accompanying styles blend together within each composition. Again, Rhitom and his mohan veena are at the heart of each piece, but the supporting cast are also playing intricate parts – they’re not there as filler, or ‘atmosphere’. How this integrates so well, even in terms of keys and tunings, is a testament to the performers, as well as the mixing and mastering work. How the Western and Indian styles blend so well is indicative of some truly amazing song crafting. Many of the compositions have a similarly light, toe-tapping feel, while a few are moodier, with bluesy, descending scales. One song that stands out from the others is the more experimental track Mohenjo Daro (the ‘City of the Dead’) – it’s about a place in Pakistan, now an archeological site, that in the Vedic Lore had fire reign down upon it. The site is radioactive to this day. This particular song churns with an urgent intensity, it’s a bit of a ‘trip’, and took me a few listens to appreciate. Like a 6-minute maelstrom, the sounds convey an almost otherworldly sorrow. It’s powerful, and effective..and it’s really the only track on the album that some listeners might find less than accessible. A few words on the sound quality of this recording. This is a digital production, recorded on a Digital Audio Workstation (DAW), like many modern recordings. I would rate it as quite good, maybe 7.5/10, from an audiophile pov. The resolution is excellent, it has clear, quick transients, and the instrument tone is well portrayed. The crucial reverb of the slide instruments is well done. It’s colourful, and non-fatiguing – I hear no “harsh digital” artifacts. All in all, very enjoyable to listen to. It actually sounds terrific with headphones. Dynamic range is pretty decent, too – Michael told me they went for 14dB of headroom between Peak and RMS, as compared with the typical 8dB used in many of today’s “loudness wars” recordings. That additional DR can really be heard in the “texture” of the guitar picking, and the more subtle volume nuances in the slide work. Really the only area where this record falls short of being “audiophile-calibre”, for me, is in terms of spatial ambiance. I know firsthand that Michael’s place has nice acoustics, but on disc I don’t get much sense of the room, or the recording space. This is something that I find is common to nearly all contemporary records – even some high-budget classical productions. Still, when you listen to Delta Raga, sonic issues aren’t in – or anywhere near – the forefront of your mind. To me, that is the essence of all great records – you get lost in the music, and forget about everything else. By that measure, this record succeeds brilliantly. Speaking of success, this album is currently not part of a record label distribution deal. Michael is launching an Indiegogo campaign to raise funding, and will later be making the album available through CDBaby online sales. See the links below for more info on buying this amazing music. Very nice work! Noah, please ask them to submit this recording to the Blues Foundation Blues.org for the next Blues Music Awards. And someone should submit it for the Grammys for 2020. Will be interesting to figure out what category to submit in! Looking forward to availability on CDBaby. Thank you for the review of this wonderful blend. Thanks for your comment, Jan! Simply amazing! My wife and I both love this and look forward to buying a copy. Thanks for your comment, David. That’s so nice to hear.